Keep costume accessories like swords, knives, shields, etc., soft, short and flexible. Tripping and falling on a solid sword is not a good time. Add reflective tape to costumes and bags so your kids are highly visible to drivers. If your kids are going to wear costume makeup, test the makeup on a small area of skin a few days before Halloween to make sure their skin or eyes don’t have an allergic reaction. Make sure their masks, costumes and shoes are well-fitted so they can easily see and walk. If they want to wear decorative contact lenses, the safest way to go about this is to go through an eye care professional. According to the American Academy of Pediatrics, many companies claim their decorative lenses are safe to use without a prescription, but this is dangerous and illegal and can cause permanent eye damage. No solo trick-or-treating. Make sure your kids walk in groups or with a trusted adult. Give your kids a flashlight to help them see and to help others see them. Instruct your kids to walk – not run – from house to house. If they run, they could slip, trip, run into others, get hit by a car. Trust us; the accident options are endless. Remind your kids not to walk near lit candles or luminaries, especially if they’re wearing a cape or a billowy costume. Teach your kids not to dart out into the street and to watch for cars that are turning or backing up. Examine all goodies for choking hazards and tampering before the kiddos dive into them. This is easier to do if you don’t send them out on an empty stomach so they don’t snack on anything while they’re out trick-or-treating. Limit the amount of treats the little ones eat to prevent upset tummies and other digestive issues. If any of your kids have food allergies, teach them how to keep themselves safe from eating treats that could harm them. Don’t have any little ones who are trick-or-treating this Halloween? You still have a part to play in keeping kids safe. If you’ll be driving during trick-or-treating hours, slow down, be extra alert and turn your headlines on extra early so your car is more visible to trick-or-treaters. Homeowners should remove anything from their porches or yards that kids could trip over, like sprinklers and lawn ornaments, and sweep up any wet leaves kids could slip on. Also, keep pets inside; there’s a lot of excitement during Halloween, so pets might unintentionally jump on or bite someone. 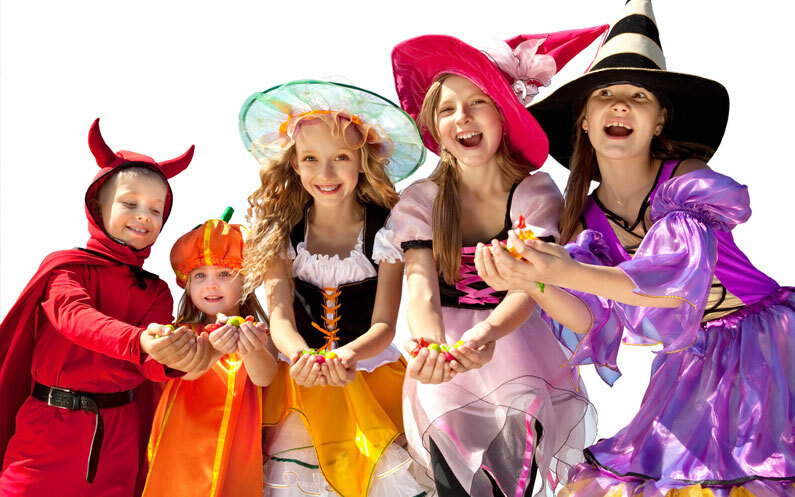 Halloween should be a magical night full of friendship, laughter and, of course, candy. Together, we can avoid any mishaps and keep your kiddos out of the urgent care center.